To explore if and how urban public transport provision has kept pace with population growth. Comparison of public transport vehicle kilometres per capita by year. 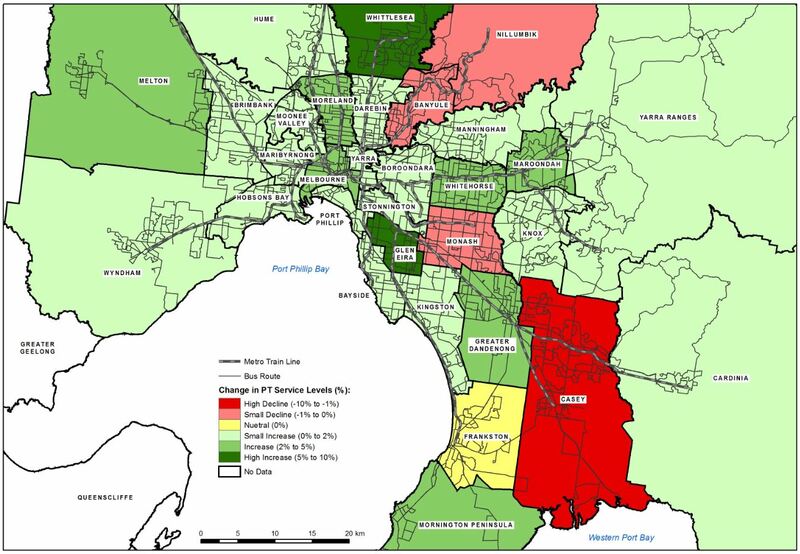 Changes in public transport service levels per capita are highly uneven across Melbourne. Data source: PTRG analysis of the GTFS file data for Melbourne. Includes bus, rail and tram. Data production undertaken by Phillip Boyles and Associates. Monitoring public transport service levels per capita over time within cities provides a useful way of determining whether public transport provision is keeping pace with population growth. Currie, G. (2016) Melbourne Transport Problems & Progress – Ideas for Bold Politicians, presented to Academy of Technology, Science and Engineering (ATSE), Parliamentary Briefing, Melbourne, October 2016.